Folksy :: Buy "Copper Heart Necklace"
A beautiful handmade heart necklace, perfect for the Winter fashions with its wonderful textured beads. Folksy :: Buy "Ceramic owl hanging decoration "
This cute ceramic owl is made from white earthenware clay with all the individual pieces hand cut and decorated. It is then fired and decorated with rich, glossy glazes and re-fired to 1100 degrees. 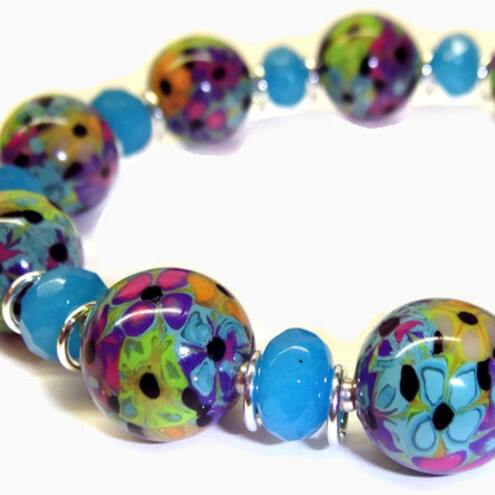 Folksy :: Buy "Flower Power Bracelet"
Designed and made for you by Shoogly Beads. Folksy :: Buy "Silver Leaf Jasper and Jade Necklace"
Folksy :: Buy "Mackintosh brooch in pewter and enamel"
This brooch, inspired by the work of Charles Rennie Mackintosh, has been hand-made in modern lead-free pewter and coloured with cold enamels.It measures 45mm across and has a 25mm pin on the reverse. Light in weight, it comes in a pretty gift box. Folksy :: Buy "Gemstone Beaded Necklace - Amazonite, Fluorite, Smoky Quartz and Agate "
Folksy :: Buy "Bracelet vintage beads and tiny flowers"
Beautiful bracelet made from wire wrapping vintage beads and tiny red flowers. 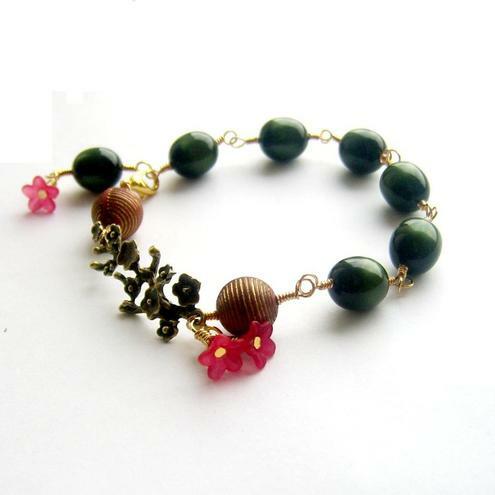 Materials - vintage green lucite moonglow beads, Vintage Russet and Gold Lucite Beads, lobster clasp, tiny lucite flowers, gold tone wire,bronze tone branch. 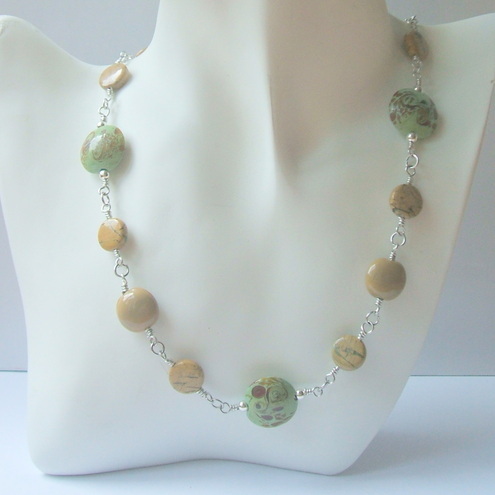 Folksy :: Buy "Stainless steel green lampwork glass necklace"
This necklace is made with large 16mm green and brown lampwork glass beads, smaller 14mm brown glass beads and 10mm disc shaped green vein jasper. Fastens with a handmade hook clasp. All metal parts are surgical stainless steel. This necklace is so pretty!! I have used aqua blue glass rectangles with a white floral design, glass pearls in white and aqua crystal bicones. Completed with silver plated round spacers and clasp. 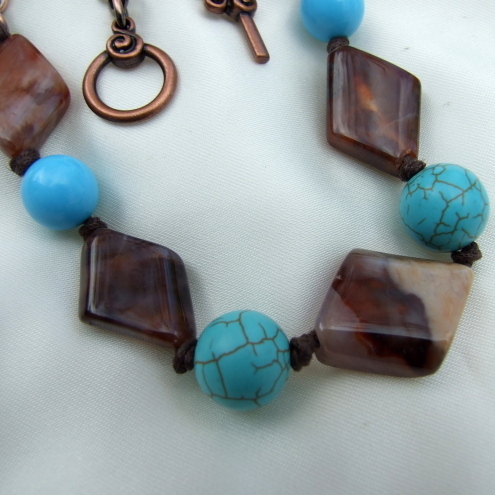 Folksy :: Buy "Agate and Turquoise Necklace"
Semi Precious Agate Diamond Shaped Beads and Turquoise beads are knotted onto antiqued copper chain with cotton cord in this simple design necklace, would look great with jeans. Necklace length 18 inches, can be altered to suit. All fittings are antiqued copper. These beautiful twinkling earrings have been handmade using Bali Silver chandeliers and purple crystal rondelles. The ear wires are sterling silver. 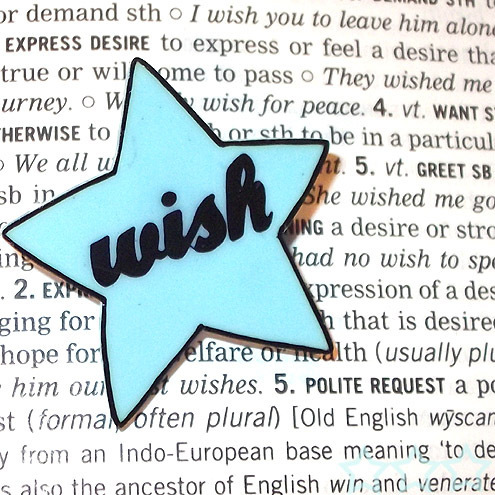 Folksy :: Buy ""Wish Upon A Star" Brooch"
"When you wish upon a star, your dreams come true"
Well I can't promise to grant any wishes, but I can promise you that you'll love this brooch! This little star carries the simple message 'wish', a sweet reminder to never give up on your dreams. Available in pastel shades of pink, yellow, blue or green (not pictured) or simple black and white. Folksy :: Buy "Individual mince pie plate for Santa Blue"
This little plate is the perfect for leaving a mince-pie out for Santa on Christmas Eve. It is made from white earthenware clay, stamped and glazed to 1100 degrees. It measures 3" or 8cm diameter and is 1cm deep. 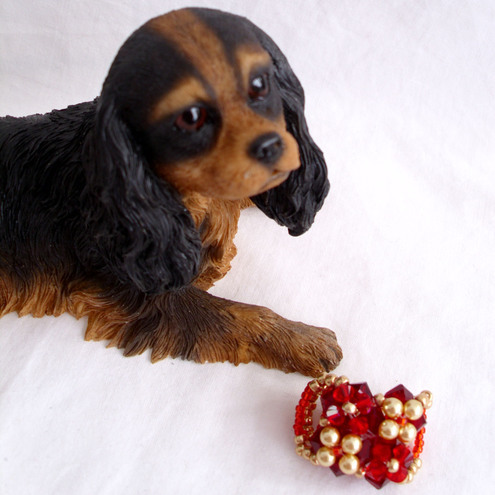 Folksy :: Buy "Rich red and gold Swarovski ring"
Deep red swarovski crystal's hand stiched into a square base embellished with more swarovski crystals and swarovski gold pearls. The band is hand stiched red and gold seed beads. The ring is currently size T which is big but it can be easily resized. 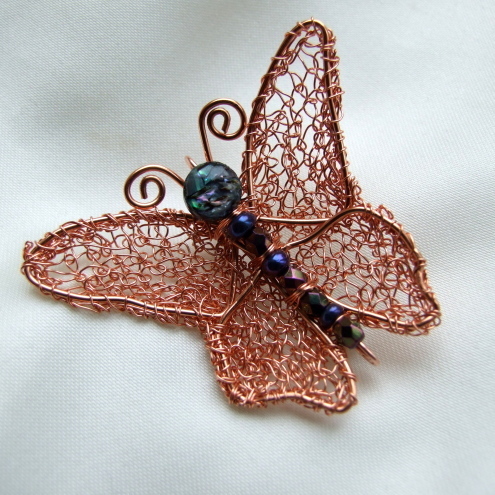 Folksy :: Buy "Hand Formed Copper and Abalone Shell Butterfly Brooch"
One off Butterfly Brooch, copper wire wrapped Abalone Shell, Czech fired and glass beads, with hand formed wire wings. The wings are formed from hand knitted copper wire which I have wrapped onto the basic wing shape. Brooch size 1.75 inches nose to tail and 2 inches wing tip to wing tip.